UFW Stories: "The Red Flag Above Us"
"The Red Flag Above Us"
We just missed our group of workers by a few seconds, but in a protest or demonstration a few seconds usually makes a world of difference and so now you have the collective effort of our direct action delegation making its hurried way up 8th street onto Olive. We run straight into the sea of moving bodies and rush all the marchers out of our way with polite but hasty, “excuse me’s”, “con permisos” and no second thought. Some begin to realize what we have in hand and help us part the sea of demonstrators, in the background someone yells, “Don’t let the flag drag!” and I quickly make my way into the center to hold that part of the flag up and say, “lead the way because I can’t see where I’m going, I’m just following the workers around me” and there I am underneath a big red flag not knowing in which direction I’m going but never the less moving forward. We quickly reach our group and along with our other fellow corroborators begin unveiling our flag and encourage the campesinos to join me in collectively holding our emblem above our heads. It was one of the most beautiful sights I’ve ever witnessed, the workers quickly unrolled the flag above them and there I was with them, with the campesions underneath the big fifty foot red flag that had the black Huelga eagle in its center. There it was, in all of its glory, hundreds of brown skins from Madera, Oxnard, Bakersfield, Delano and Porterville draped in the infamous general strike red tone. 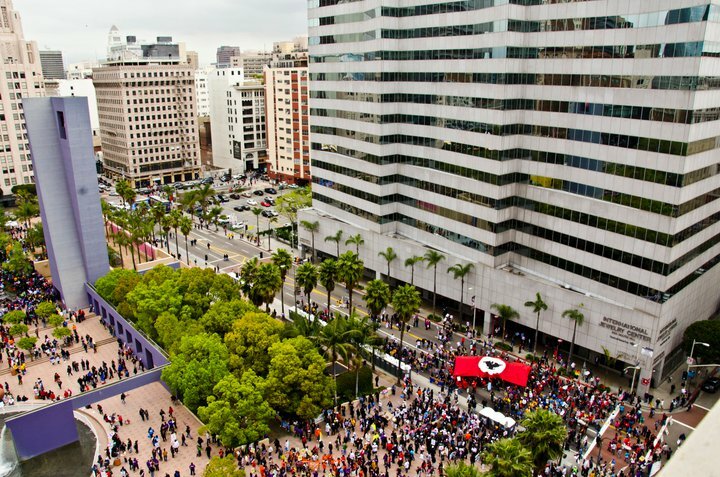 They cheered, raised fists, gave thumbs up in approval, it made for greater cheers from the larger demonstration, the black eagle over the red flag, and the campesinos proudly marching with their surprise for Los Angeles. The crowd looked on in amazement at the huge flag that we were carrying over our shoulders, by this time photographers began approaching and passer by’s would ask for anything with the black eagle on it. My job there was done. I took a deep breath and took a step back, admired the workers and continued on in the struggle because the real work was nowhere near done. Never the less, that moment now turned memory gets filed as a small victory … and I’ll take it.